TOMODACHI often carries a wide variety of stationery and pens, and one of our newest products is the Pilot FriXion Ball retractable gel pen! A variation on the popular Pilot FriXion line of pens, the FriXion Ball pen takes advantage of thermo-sensitive inks to create an easy-to-use gel pen that can be erased with the specialized rubber tip at the end of the pen. 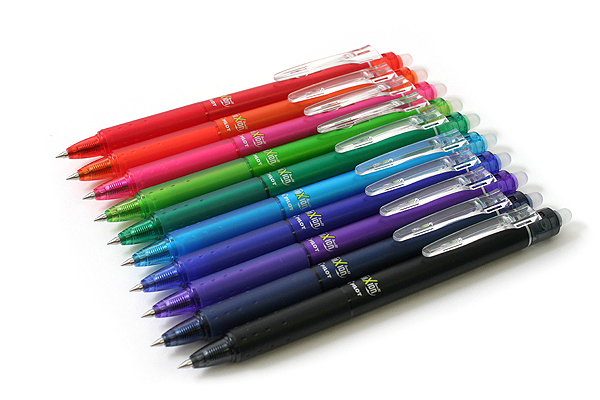 Not only that, unlike other FriXion pens, the FriXion Ball is retractable, simply by pushing on the clip! A special trick is that since the pen uses thermo-sensitive gel ink, you can make any erased text reappear by chilling the writing to under 14 degrees Fahrenheit; just put the paper in your freezer, and watch the writing reappear! These cool erasable pens are available at TOMODACHI, at both our Rosedale Shopping Center location as well as our Mall of America store, and are available in a wide variety of colors.